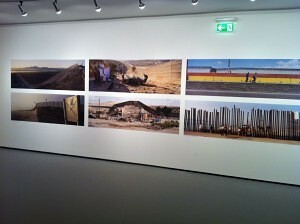 The 2012 annual FotoDoks festival and exhibition of contemporary documentary photography, which was held in Munich’s City Museum, provided an opportunity for some of the world’s best photographers to display their works of art under the theme ‘Attention – Respect, Control and Change’, which aims to reflect the complex issues that are facing contemporary documentary photography. The show features 15 stunning photographic positions, by seven British and eight German photographers, all of which were dedicated to a particular issue of our time. Renowned photographer Kai Wiedenhöfe chose Sihl Wallpaper Persomural 170 to replicate eight panoramic border views, each measuring 210 x 70 cm, taken between the USA and Mexico. This high quality paper has an elegant and water fast inkjet coating and, when printed with water based pigment inks the fine matt surface structure finish achieves high colour brilliance with a wide gamut which does full justice to the skillful panoramic photography. Furthermore, Persomural 170, which can be used in conjunction with everyday wallpaper paste, offers the high opacity and tight structure required to facilitate perfect covering, even over small cracks and uneven walls.